Solatube: Go green, Save money on beautiful lighting, and do something nice for yourself! Pretty cool, right? 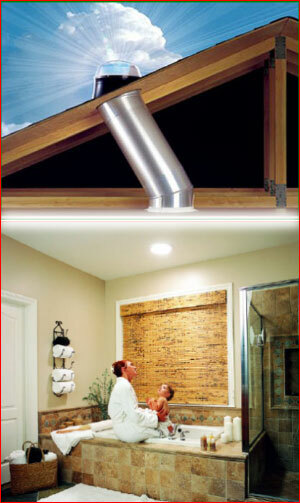 That’s what I think about tube skylights, they work great and save money. They are exponentially more well insulated than a skylight and provide more natural light that is softly diffused and directed to a broader area because of the glass diffuser sunlight passes through. This light diffusing action is all happening at the ceiling level rather than several feet up in a skylight well. Observe in the photo how light is being shed onto the walls and bathroom so beautifully. It’s reality, that’s how these things work. A skylight would cast a large square shadow while the tube skylight floods the room with light. The price is less than a skylight also and the mess is non-existent. There is no mess, can be installed in a couple of hours, vaulted ceilings, flat ceilings, Victorian and many more applications. The solatube ranges in price from 150$ small – 250$ large and installation labor cost is $350. So, a basic install which covers 90% of suburbia falls into that category (Five hundred-six hundred dollars). Some special applications require slightly more labor cost. Right now and anytime I would like to offer new and returning customers, everyone, a 50$ discount on a standard solatube install. That’s as many solatube’s as your heart desires value priced at $450.00 for the first one and for an additional solatube for the cost of the product and I will reduce the labor by 50%. That is $175 labor cost and 150$ for the solatube on additional purchases. Total Saved on two solatubes $225 !!!!!! add as many as you like for this value price. It’s a great deal. Posted on February 28, 2012 September 12, 2012 Author creektuberCategories UncategorizedLeave a comment on Solatube: Go green, Save money on beautiful lighting, and do something nice for yourself!